This is the first trailer for The Man Who Killed Don Quixote. 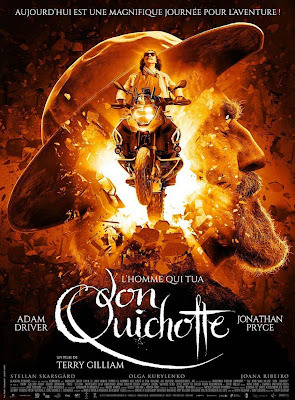 Directed by Terry Gilliam, it stars Jonathan Pryce (Game of Thrones) as Quixote and Adam Driver (Star Wars: The Force Awakens) as Toby, Olga Kurylenko (Quantum of Solace), Stellan Skarsgård (Avengers: Age of Ultron), Joana Ribeiro (A Uma Hora Incerta), Eva Basteiro-Bertoli (Black Bread) and Rossy de Palma (Women on the Verge of a Nervous Breakdown). Check out the synopsis and trailer below. "The Man Who Killed Don Quixote follows Toby, a jaded commercials director who travels to Spain for a shoot and comes across a gypsy who gives a copy of his student film — a lyrical re-working of the Don Quixote story set in a quaint old Spanish village. Moved by the discovery, Toby sets off on a bizarre road trip to find the little village where the student student film was shot and gets caught up in a series of catastrophes."